This week Mark is back looking at a classic Sci-Fi film from the past. This time it’s the 1956 movie, “Earth vs. The Flying Saucers” for the podcast. Here are some words from Mark himself about his most recent show. This is Mark Daniels from the Great Pacific Northwest. I’m back this week with another classic science fiction movie. This week I’m going to take a look at one of the best Sci Fi B-movies of the 1950s. It’s The Earth vs. 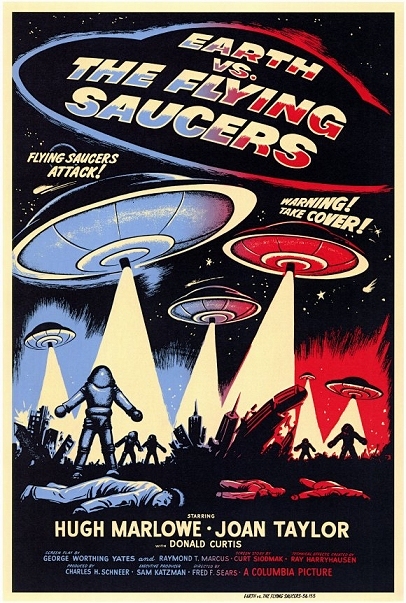 The Flying Saucers from 1956; starring Hugh Marlowe and Joan Taylor. It’s one of Ray Harryhausen’s early movies. It’s a fun movie and definitely worth watching. I hope you all enjoy it. Thanks again to Mark for another fun, classic SF movie review. I’ve embedded the movie down below too for your viewing pleasure. I will be back next week with a look at the author Harlan Ellison. Until then take care and enjoy your week ahead. Great podcast. I enjoy M5’s classic scifi podcasts. Look forward to more.